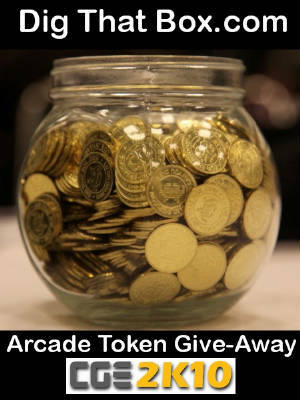 These custom minted arcade token are part of limited run of 5000. They were created by Artist Christian George-Morehouse in co-operation with the good people at Osborne Coinage. This is the last of the tokens we created especially for the 2010 convention circuit. These tokens were distributed to lucky guests at the E3 Expo 2010, San Diego Comic-Con 2010, and now at the prestigious Classic Gaming Expo. These tokens have also given to notable gaming celebrities including Verne Troyer, Yuji Naka, Tommy Tallarico, Tomonobu Itagaki, Peter Molyneux, Greydon Clark, Kevin Smith, and Leonard Nimoy! 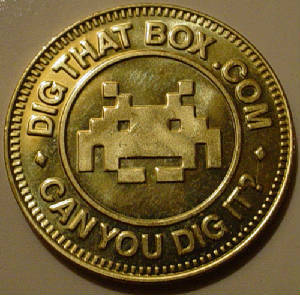 We here at DigThatBox.com greatly anticipate the 2010 Classic Gaming Expo. This year's show looks to be one of the best in CGE history. We look forward to meeting you all in Las Vegas. See you there! Atlanta, GA – July 28, 2010 — The Georgia Game Developers Association (GGDA) today announced that Nolan Bushnell, founder of the video game industry, will deliver the keynote address at the fourth annual Southern Interactive Entertainment and Game Expo (SIEGE). Scheduled for Oct. 1 – 3, 2010, at the Crowne Plaza NW Atlanta hotel, SIEGE focuses on the fast-growing game design industry in the South. Best known as the founder of Atari Corporation and Chuck E. Cheese Pizza Time Theater, Bushnell now devotes his talents to Tapcode, a company that develops digital media entertainment and hospitality software showcased in the restaurant uWink, an interactive restaurant that allows customers to order food, drinks, games and other media at their table through touch screen terminals. He serves on several Boards of Directors, and was recently appointed to the Atari Board. Inducted into the Video Game Hall of Fame and the Consumer Electronics Association Hall of Fame, Bushnell was named one of Newsweek’s “50 Men That Changed America.” In March 2009, Bushnell was honored with the British Academy of Film and Television Arts Fellowship Award, the highest accolade the Academy bestows, for his outstanding creative contribution to the Video Games Industry. Currently a biopic about Bushnell, tentatively titled Atari, is in pre-production. The story was acquired by Leonardo DiCaprio’s production company and is set to star Leonardo DiCaprio as Mr. Bushnell. Now in its fourth year, SIEGE features leading figures from a wide spectrum of the industry, including artists, programmers, designers, writers, teachers and business executives. Other speakers include government figures, experts on computer game violence, social issues, serious games and more. The event has attracted a variety of sponsors, including Georgia’s Department of Economic Development. Conference sessions include classes on the latest software, game design techniques, business issues, starting a new company, and more. More information can be found at www.siegecon.net. Haunted House Trailer - The Classic Atari 2600 Game Reborn! ATARI’S ICONIC HAUNTED HOUSE LIVES AGAIN! Lyon, France – July 27, 2010 – Enter the Haunted House, if you dare. Atari’s classic groundbreaking game has returned with more chills, cool new unlockables and plenty of spooky new enemies. The terrifying fun that lies within Graves Mansion is back as Atari, one of the world's most recognized publishers and producers of interactive entertainment, scares up its legendary classic, Haunted House - re-imagined for a new generation of gamers in celebration of the title's 30th anniversary. Haunted House will take control of Wii®, Xbox LIVE® Arcade for the Xbox 360® video game and entertainment system from Microsoft, and Windows PC Download this fall, with suspense filled challenges, new chilling environments and more frightful enemies than ever before. Avid fans of portable emulation are sure to be familiar with Game Park Holdings. This is the company behind the extremely popular GP2X series. This month the company will release their latest and greatest creation, the GPH CAANOO. The company is very confident in their new product, and with good reason, their previous hardware has developed a loyal following. This time GPH is setting their sites on Nintendo, with hopes that the CAANOO will capture 1% of Nintendo's coveted portable market share. Those who have tried the CAANOO feel this lofty goal is well within the company's grasp. This unique device is like the swiss army knife of portable game systems. Online gaming, emulation, multimedia, motion controls, touch screen gaming and more. CAANOO can do it all. CAANOO also features MAME (multi arcade machine emulator) emulation support for thousands of classic arcade titles. Games can easily be downloaded for free from a number of different web sites. This massive catalog of games spans several decades. It gives the CAANOO a robust selection of software unmatched by any portable on the market. CAANOO is an Open Source portable game system. Using the SDK provided by GPH, independent developers can create their own games, apps, and software. Ambitious developers can even sell their games for a profit on the website FunGP.com. This unique free market, profit sharing approach will ensure the CAANOO has abundant support from the development community for years to come. The possibilities are endless with CAANOO. This device can do anything you want it to. The only limit is your imagination. Redwood Shores & Los Angeles, Calif. – July 21, 2010 – Trion Worlds and Petroglyph Games are bringing the epic soundtrack of the highly-anticipated MMORTS, End of NationsTM, to Comic-Con International: San Diego during a special performance of Video Games Live. On Saturday, July 24th legendary game composer, and End of Nations Audio Director, Frank Klepacki will take the stage at the San Diego Civic Theater for the world premiere of the End of Nations soundtrack during Video Games Live: Bonus Round. Klepacki will join other renowned game composers for a special installment of the popular concert series, which celebrates the music of video games with live performances along with exclusive video footage and music arrangements, synchronized lighting, special fx, solo performers, live action and unique interactive segments to create a one-of-a-kind entertainment experience. The show begins at 8pm at the San Diego Civic Theatre, and tickets can be purchased on the Video Games Live website at http://www.videogameslive.com. With more than 15 years of experience, Klepacki has worked with notable developers and publishers including SEGA, LucasArts, Electronic Arts and Disney producing some of the most well known soundtracks in gaming. His work can be heard in some of the best real-time strategy games of the past decade, such as Command & Conquer (C&C), Star Wars: Empire at War, and C&C: Red Alert, which won an award for best soundtrack from PC Gamer magazine. "I've known Frank for over 16 years and his work as a video game composer is always amazing," said Video Games Live creator and executive producer Tommy Tallarico. "His music for End of Nations is incredible as well, and we're looking forward to performing it all over the world." In addition to the concert, ticketholders will receive a free copy of the official End of Nations “Issue Zero” comic. The prequel to a four part miniseries is set to debut this fall, Issue Zero tells the story of a group of resistance fighters attempting to free themselves from the vice grip of the Order of Nations, the main villain of the game. Complimentary copies of the comics will also be available at the DC Comics booth, with the writer and artists on hand throughout the show for signings. Video Games Live is launching a 90-minute PBS special as part of special programming airing in July-August 2010 on PBS stations nationwide, consisting of never before televised live musical performances from the Mario, Zelda, Sonic, Halo, Warcraft, Final Fantasy, Castlevania, God of War, Civilization, Chrono Cross, StarCraft and Guitar Hero franchises, including a musical journey through classic gaming. For more information about Trion Worlds, please visit www.trionworlds.com. For more information about End of Nations, please visit www.endofnations.com. For more information about Video Games Live, please visit www.videogameslive.com. Virtual Air Guitar Company Ltd, a Helsinki–based independent game developer and computer vision specialist, debuted its latest full-length trailer for the fighting adventure game, Kung-Fu LIVE, coming this Fall to PlayStation® Network. Kung-Fu LIVE fuses players into a world of pulp action-comics with accurate real-time motion and image scanning, letting fans step into the fight like never before. Using the PlayStation®Eye, Virtual Air Guitar Company’s patented Freemotion® technology has helped to create the first controller-free fighting game of its kind that challenges players to survive using a limitless array of martial arts and acrobatic moves with their own bodies. With enormous interactive environments, a roster of impossible-made-possible power moves, and unique multiplayer components, Kung-Fu LIVE ensures that your Bruce Lee moments will be full of awesomeness. Launching later this Fall on PlayStation Network, Kung-Fu LIVE will provide a fast, fun, and action packed experience while ushering in a new era of full-body motion gaming. If you are interested in learning more about Kung-Fu LIVE, please visit www.kungfulivegame.com or look for more details on the Faceboook page for Virtual Air Guitar Company. Nexon America’s appearance at Comic-Con International at the San Diego Convention Center will feature playable demonstrations of Vindictus, the first physics-based action multiplayer online action role-playing game. Nexon America will be at the Gaming University booth, #4445, with demo stations set up for the first hands-on of Vindictus offered to the public. Vindictus uses a modified Source EngineTM to enable actions like throwing, shattering, binding with chains, piercing with spears, and more. Visitors to the Nexon stations will be able to engage in high-speed combat and experience the stunning visuals of the free-to-play game that adds brutal elegance to the PC gaming space. Vindictus is scheduled for release later this year. Nexon America currently publishes Combat Arms, MapleStory, Mabinogi, and PopTag! and is building a new online platform for its titles. This platform, called BlockParty.com, will help gamers maintain friendships in and out of Nexon Games. For more information on Vindictus, visit www.vindictus.com. Join other fans at www.facebook.com/vindictus. Attendees at the upcoming Comic-Con International 2010 will have an opportunity to experience two of the summer's most anticipated video game releases. For the first time since 2006, Nintendo of America will be a featured exhibitor at the annual Comic-Con expo, scheduled to take place July 22-25 at the San Diego Convention Center. Visitors will be invited to enjoy hands-on demonstrations of DRAGON QUEST® IX: Sentinels of the Starry Skies for the Nintendo DSTM family of portable systems, which launched on July 11, and MetroidTM: Other M for the WiiTM system, which launches across North America on Aug. 31. Both games will be available at the Nintendo booth, #2944. The latest installment in the popular DRAGON QUEST franchise, DRAGON QUEST IX: Sentinels of the Starry Skies features deep customization options and remarkable wireless features that let players of all kinds embark on an epic hand-held adventure. Players can choose their own appearance, occupations, companions and special items to aid in their quest, and even connect with friends for cooperative multiplayer fun. In addition to live demos of the game, Comic-Con attendees who bring their Nintendo DS systems and copies of DRAGON QUEST IX: Sentinels of the Starry Skies to the show will have access to a special downloadable treasure map called Mortamor, available for the first time in North America. The map will be available at the Nintendo booth for the duration of Comic-Con International 2010. To access the map, players must have their Nintendo DS system running the DRAGON QUEST IX: Sentinels of the Starry Skies game and set to “Tag Mode.” Once players get to the town of Stornway, they are able to access Tag Mode at the Quester's Rest inn. The highly anticipated Metroid: Other M is a dramatic new chapter that brings the Metroid series back to its franchise roots. Starring the iconic bounty hunter Samus Aran, the game is the result of a dedicated collaboration between the director of Super MetroidTM, Yoshio Sakamoto, and renowned game development studio Team Ninja. This joint effort blends expert level design, gripping visuals and a cinematic storyline with seamless third-person and first-person game play controls. For the first time, players will learn the story of SamusTM inside the suit. Comic-Con attendees will get a chance to play portions of the game in advance of its Aug. 31 launch date. WHAT: A weekend tournament held in the Sony Online Entertainment booth at San Diego Comic Con, July 22-25. Fans will have their chance to become legends in the new online world of DC UniverseTM Online (DCUO), competing for great prizes and a chance to create a character for SOE’s upcoming action MMO, DC Universe Online. Teams of 2-players each will square off in a ladder tournament of heroes vs. villains Thursday through Saturday, with the two finalist teams battling it out in arena combat for the title of Next Legend! Tournament highlights will be tracked and updated on the DC Universe Online website (www.dcuniverseonline.com), as well as on the DCUO Facebook and Twitter pages. The two finalist teams will both receive the chance to create an in-game character that will be put into the live game as part of a high-level combat encounter, becoming a permanent part of the game world. Both finalist teams will also receive a copy of DC Universe Online at launch (PC or PS3 version). The winning team earns the title of Next Legend, and will receive a prize package of DCUO-related gifts, including a limited edition Batman/The Joker poster autographed by superstar artist and DCUO Executive Creative Director, Jim Lee, a DCUO Collector’s Edition game pack and an SOE 30-Day Game Time card. Entrants will be selected at random via lottery and notified of their eligibility for the tournament by 5:00PM PT on July 19, 2010. The competition will be ladder style, with eight teams competing on Thursday, four on Friday and the finals taking place on Saturday. For more information on DC Universe Online, visit the website, www.dcuniverseonline.com. 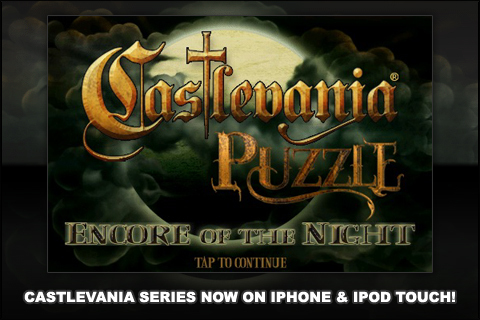 Konami Digital Entertainment GmbH today announced that their first ever version of Castlevania for iPhone and iPod touch 'Castlevania Puzzle: Encore of the Night' is now available on the App Store. Castlevania Puzzle: Encore of the Night is a new puzzle-orientated role-playing title that uses key elements and characters from the long-running series. The player is cast as Alucard, the son of Dracula, or a wide range of recognisable characters from Castlevania lore, wherein they are set a series of tough challenges that will reward them with items useful for their ongoing mission. As such, as the player explores the game’s Transylvanian castle location, they are put head to head with forces of good or evil, and use a range of weapons and spells against their opponent in intense head-to-head battles. Castlevania Puzzle: Encore of the Night has been designed to make full use of the touch-screen capabilities of the iPhone and iPod touch, and offers a playable new take to the Castlevania series. Lyon, France - July 15, 2010 – Atari, one of the world’s most recognised publishers and producers of interactive entertainment, announced today the launch of the Star TrekTM Online Architect. The STO Architect (http://www.startrekonline.com/architect/) gives fans even more access to the Star Trek universe than ever before, providing the necessary virtual tools for them to create their favorite starships and share then with others. The Architect also includes a gallery for fans to view their creations, a mini-game and an Intel® sponsored sweepstakes with prizes that include a replica captain’s chair, Intel® CoreTM i7-920 Processors and copies of the Star Trek Online game. Created and developed by The Game Agency, a New York and Los Angeles based marketing firm, the mini-game, Star Trek Online Ship Shaper, challenges players to build Star fleet ships as quickly as possible and top the leaderboard. Once a ship order has come in, the player must grab the correct pieces from the slider and assemble the ship quickly. Points and bonus time are awarded for fulfilling the ship orders correctly. It is a fun and frenzied game that is easy to pick up and play. In Star Trek Online, the Star Trek universe appears for the first time on a truly massive scale. In this massively multiplayer online game from Cryptic Studios and licensed by CBS Consumer Products, players can pioneer their own destiny as Captain of a Federation starship. Or, they can become a Klingon Warlord and expand the Empire to the far reaches of the galaxy. Players can visit iconic locations from the popular Star Trek fiction, reach out to unexplored star systems and make contact with new alien species. With Episode missions, every moment spent playing Star Trek Online will feel like a new Star Trek episode in which you are the star. Immerse yourself in the future of the Trek universe as it moves into the 25th century: a time of shifting alliances and new discoveries. "It's a pleasure to be able to finally present a portion of our incredibly robust Star Trek Online ship creation and customization tools on the web," says John Needham, CEO of Cryptic Studios. "Working with The Game Agency and Intel has enabled us to give fans and newcomers a chance to construct their own Federation starships with an easy-to-use interface. The Architect also serves as a terrific introduction to the Star Trek universe, which everyone can enjoy in Star Trek Online." For more information about Star Trek Online, please visit www.startrekonline.com. TM, ® & © 2010 CBS Studios Inc. STAR TREK and related marks and logos are trademarks of CBS Studios Inc. All Rights Reserved. The GPH CAANOO is an amazingly versatile Portable Gaming System. CAANOO has a large, 3.5" LCD Touch Screen. The screen is bright, colorful, and clear. (Screen Resolution is 320 x 240.) The CAANOO has a built in microphone, speakers, and even a force feedback (rumble) motor. CAANOO also features a built in G-Sensor for gyroscopic / tilt control. External memory support includes SD and SDHC cards up to a 32GB. CAANOO is a sleek and sturdy machine with high quality buttons, triggers, and a unique 3D Joystick. The device has a large catalog of high quality, exclusive games, some of which also include WiFi support. The CAANOO can also run emulators for your favorite classic game consoles, portable game systems, arcade machines, and even PC. Games and Apps can be downloaded on FunGP.com, the official web store for GPH. Independant and Homebrew developers can actually create their own games sell them through the FunGP.com network. Traditionally GPH game systems have always had tremendous support from the Independant Development Community. Giving indie devs the ability to profit fromt their work ensures the CAANOO will continue the tradition. The CAANOO is also an outstanding Media Player. CAANOO supports a wide variety of media file types including .divx, .xvid, .avi, and MP3. It also supports E-Book and image files including JPG, BMP, .GIF and .PNG. 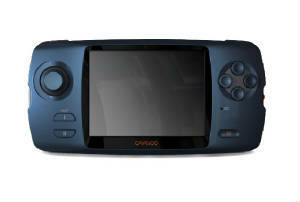 The CAANOO is brought to you by Game Park Holdings, the people behind the extremely popular GP2X series. It ships worldwide in mud July 2010. Our YouTube Channel is overflowing with new videos! In the past week we've added literally dozens of new videos. See the latest trailers for some of the hottest new games. Plus watch exclusive videos for the Nintendo 3DS, Sony Move, and the Xbox Kinect. They're all just a click away! COUNTY ROSCOMMON, IRELAND (JULY, 2010) – Recent surveys indicate that consumers are not sold on the idea of home-based 3DTV. Of those surveyed, nearly 70 percent of those who don’t want 3DTV cited the stereoscopic glasses as the main reason. RealView Innovations’ 23” and 32” Deep Screens, which debuted in the US at E3 in June, are the only available multi-dimensional solutions available to consumers that do not require 3D glasses. Equally important, the Deep Screen works with any current movie, DVD or video game available. Using patented Depth-Enhancing Technology that uncovers depth cues hidden in 2D images, the Deep Screen uses a combination of sophisticated optical components that work seamlessly with existing TVs, PCs and LCDs by simply fitting over the screen. Once the Deep Screen is in place over the monitor any movie, show or video game will instantly exhibit a rich, multi-dimensional expansion of images, colors and space. Images seem to extend forward from the viewer, as if expanding the screen’s depth and providing a wider visual horizon. There are no glasses or software required or any type of pre-programmed content. It’s ready out of the box (larger version will be available in late 2010). July 9th 2010 – Prepare yourself for a Metroid adventure like no other. Stunning action and a moving personal story come together in an unforgettable way in Metroid: Other M, launching across Europe for Wii on 3rd September 2010. This is a dramatic new direction for a legendary franchise and a bold new blend of cinematics, storytelling and stylish, no-holds-barred action. Charge up your Beam, arm your Bombs and get ready to scan your environment for a copy of Metroid: Other M when it launches in The United States on August 31st and across Europe for Wii on 3rd September 2010. 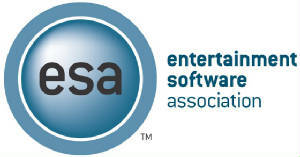 On June 15, the Entertainment Software Association (ESA) returned to the Los Angeles Convention Center to host the 16th Annual Electronic Entertainment Expo (E3). Recognized as the premier global showcase for the computer and video game industry, the three-day event drew a crowd of more than 45,000 publishers, developers, business executives, gamers and members of the media. Attendees were able to explore the latest in games, peripherals and hardware from over 300 exhibitors representing 90 countries. "E3 Expo is truly the global stage for the interactive entertainment industry, and the 2010 show was truly reflective of the innovation, growth and vitality of our industry,” said Michael D. Gallagher, president and CEO of the ESA. "We are thrilled by the positive news generated by this year's show, and we are looking forward to building on this great momentum for 2011." This year's high turnout also illustrates the public's enthusiasm for the newest titles, exciting innovations in game technology, and the expansion of gaming platforms. One of the major innovations on display was the use of 3-D technology across multiple platforms. New game controllers that are capable of detecting a player's motions, as well as a hands-free motion sensing system, were also a big hit. This pioneering technology uses a number of cameras and microphones for completely hands-free gaming and console control. "This year's E3 Expo has again delivered above our expectations," said Graham Hopper, executive vice president and general manager, Disney Interactive Studios. "With retail participation up 20%, strong international media attendance, partnered with a dynamic show floor environment, E3 Expo has affirmed its status as the cornerstone event for our global video game business." As the event drew to a close, attendees were already anticipating the next E3 Expo. Organizers pledged that next year's E3, scheduled for June 7-9, will build on the momentum generated by this year's show. Konami Digital Entertainment, Inc. today revealed the release date for Castlevania Harmony of Despair, the first Castlevania game exclusively for Xbox LIVE® Arcade for the Xbox 360® video game and entertainment system from Microsoft. Set to release as the third title out of five from the XBLA Summer of Arcade program, Castlevania Harmony of Despair will be available for consumers to download on Wednesday, August 4. Along with the release date, Konami has also revealed five new screenshots to go along with the announcement today. In Castlevania Harmony of Despair, fan favorite vampire hunters from throughout the series come together in order to return Dracula to his eternal slumber. Joining forces with friends on Xbox LIVE, up to six players can explore massive levels inspired by the worlds of Castlevania Dawn of Sorrow, Portrait of Ruin and Order of Ecclesia via online co-op play. As players employ their cooperative skills to unleash devastating attacks and fight the forces of darkness, they can discover hidden locations, special items and equipment to help in their quest. Fearless players can even choose to engage in competitive Survival Mode with friends to and determine the best slayer of evil. Featuring detailed 2D art with the ability for players to zoom in and zoom out of the entire map of each level adding in a completely new dimension of gameplay, Castlevania Harmony of Despair will provide players with a thrilling, next generation experience coupled with the classic Castlevania aesthetic. To keep the momentum after initial launch, there are also plans for downloadable content featuring new characters along with new levels. London, UK - 6th July, 2010 - Summer is in full swing and the only thing more blistering then the July sun, is the guitar solos, drum fills and vocal ranges in the 12 new additions to the Guitar Hero® music library. Compatible with both Activision Publishing, Inc.'s (Nasdaq: ATVI) Guitar Hero® 5 and Band Hero®, as well as forward compatible with Guitar Hero®: Warriors of Rock when it's released this autumn, these latest additions to the music library will feature tracks from GRAMMY® Hall of Fame Award winners Queen, heavy metal rockers Avenged Sevenfold and Disturbed, and the Guitar Hero debut of hard rock band, Shinedown. To kick things off, world-renowned British rock band, Queen, returns to Guitar Hero with an all-new three song track pack that will satisfy both Queen and Guitar Hero fans alike. Available for download beginning today, the Queen 2 Track Pack will feature three of their biggest hits, including "Crazy Little Thing Called Love," "Killer Queen" and "Somebody To Love." Before American rock band Avenged Sevenfold rips it up in the on-disc set list for Guitar Hero: Warriors of Rock when it hits stores this September, they'll first bring three killer tracks to the Guitar Hero music library on 13th July. The Avenged Sevenfold Track Pack will allow fans to shred along with three hit singles, "Afterlife," "Almost Easy" and "Scream," from their self-titled, fourth studio album..
Gamers looking to experience the hard rock, musical stylings of Disturbed should grab their axes, drumsticks and microphones and get ready for the Disturbed Track Pack on 20th July, which features "Down With The Sickness," the second single off their debut album, The Sickness, joins "Stricken," the lead single off the bands third studio album, Ten Thousand Fists, and "Indestructible" the fourth single off their fourth studio album similarly titled, Indestructible. Continuing to provide compelling ways for gamers to experience and interact with premier music like never before, the Guitar Hero music library is proud to announce Shinedown's debut Guitar Hero appearance. Starting on 27th July , fans can enjoy the Shinedown Track Pack, which features "Devour," "Second Chance" and "Sound of Madness," three of the biggest hits off their certified Platinum album, The Sound of Madness. The Queen 2, Avenged Sevenfold, Disturbed and Shinedown track packs will be available on Xbox LIVE® Marketplace for the Xbox 360® video game and entertainment system from Microsoft for 440 Microsoft Points, on the PlayStation®Store for PlayStation®3 computer entertainment system for £3.99 and for WiiTM for 550 Wii PointsTM. All songs in each track pack will also be released as downloadable singles for the Xbox 360® video game and entertainment system from Microsoft for 160 Microsoft Points, PlayStation 3 system for £1.59 and Wii for 200 Wii Points each. In addition to the in-game music store and Xbox LIVE Marketplace for Xbox 360, Xbox 360 owners can expand their Guitar Hero music library using the Guitar Hero VIP Pass Music Store, available exclusively on Xbox LIVE® online entertainment network. For more information about Guitar Hero 5, Band Hero, Guitar Hero: Warriors of Rock and their entire line-up of downloadable songs and disc imports, please visit www.guitarhero.com. July 5th, 2010 – Today marks a great day for both the App Store and the Australian games development industry, and Halfbrick has never been prouder to be a part of both! After just 74 days on sale, Fruit Ninja has stormed past the one million copies sold mark, solidifying its position as one of the highest rated, biggest selling and most popular iPhone games of all time. Fruit Ninja began as a simple gameplay concept from lead designer Luke Muscat. During a round of game pitches that Halfbrick conducts on a regular basis, Luke brought forth Fruit Ninja. On October 15th 2009, the company knew that it was something special, something that could be a huge iPhone hit with the correct execution. Thankfully, the fruit enthusiasts were correct! Commencing development in early 2010, Fruit Ninja was a smooth ride, with all the elements of visceral and juicy combat falling into place perfectly. With continuous playtesting ensuring the gameplay remained tight and satisfying, Fruit Ninja was released on the App Store in its original form on April 21st, 2010 for US$0.99. In two days it shot to the top ten paid apps in Australia, and the success began to spread around the world. It has reached the #1 top paid app of any kind in seven countries, and has been in the top ten USA paid apps for 60 out of the 74 days since release, where it happily resides to this day. The continued support of Fruit Ninja has been modeled on regular free updates. Five updates have been released so far to add additional content and features based on feedback from the fans and written reviews around the world. The team isn’t stopping at the one million mark - there will be more updates to ensure Fruit Ninja remains a modern, fresh and extremely fun iPhone game! Halfbrick consists of friends and constant fun. With almost 40 employees from all walks of life working on a wide variety of projects, the top priority is to ensure that everyone can get paid, feed their families and continue making great games in an awesome environment. There are no secrets, just a group of highly talented individuals who want to provide top quality games for a worldwide audience! So what’s next? Fruit Ninja HD is being submitted to the iPad app store today for release the week of July 11th, and will expand on the current Fruit Ninja gameplay with amazing HD graphics and two new multiplayer split screen modes. It’s the next step to the Fruit Ninja legacy, and as per usual we are committed to ensuring it receives the same attention with updates and new content as the current iPhone version. "As we go into the July 4th holiday weekend and we gather for the parades, bbqs, beers and fireworks we also need to stand up for our rights that this country was founded on. Please take a moment to sign the Gamer Petition and show your support for free speech and the First Amendment. It takes seconds to sign and your voice will be added to tens of thousands of others when the Supreme Court hears this case next session. Please sign it today and make sure to tell your friends." France – June 25, 2010 – Games publisher Eurocenter announced today that its Ace Tennis 2010 Online is now available for the iPhone, iPod touch. The game was released on the iPad last month. Ace tennis 2010 Online is the first tennis game supporting the new iOS4 and iPhone4. It is also the most competitive and addictive "console quality" sports title. The game was designed with the avid tennis fan in mind and showcases the realism of the actual sport of tennis. The game boasts HD graphics, tournaments, various court types, an advanced scoring system, and a single and online multiplayer gameplay. It also supports all tennis strategies, including Long Ball, Short Ball, Lob and Smash. Ace Tennis 2010 Online features three different court types (grass, sand, and indoor). As in the real-life game of tennis, each type of tennis court surface comes with its own characteristics, which can truly affect the playing style and feel of your game. As you become more familiar with Ace Tennis 2010 Online, you begin to master your shots, understand your opponents and anticipate how the ball will respond to each court surface. A combination of touchscreen and accelerometer controls, gives both casual and pro gamers a fantastic experience right from the start. By tapping the screen you can control where your player runs on the court, but the swing is automatic with tilt influencing volley direction. You can play Ace Tennis 2010 Online in single player mode against the AI or kick the competition up a notch and invite friends to enjoy the lively game online.